Working natural gas inventory levels in the Lower 48 states since April have been lower than they were in 2016, according to EIA’s Weekly Natural Gas Storage Report (WNGSR), but they are still higher than the previous five-year average (2012-2016). 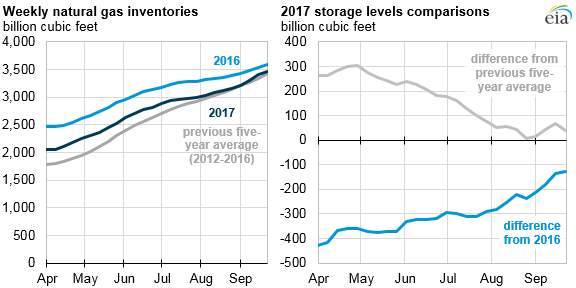 For the week ending September 22, 2017, natural gas storage levels were 127 billion cubic feet (Bcf) lower than at the same time last year but 41 Bcf higher than the previous five-year average. Natural gas storage levels typically decrease during the winter heating season (November through March) and increase during the injection season (April through October). Natural gas inventories were relatively high going into the 2017 injection season because warmer-than-normal winter temperatures reduced last winter’s demand for heating in homes and buildings. This resulted in lower-than-normal natural gas withdrawals from storage this past winter and led to the first-ever net injection in the month of February. During the summer of 2017, the rate of natural gas storage injections largely followed the same pattern as in 2016, but for different reasons. The summer of 2016 followed a historically warm winter, so natural gas storage levels began the season at record-high levels for that time of year. Natural gas demand in the power sector also reached record levels, and less gas was injected into storage. In the summer of 2017, power sector demand for natural gas was lower than the previous summer, but other factors have also changed. More natural gas is being exported by pipeline and ship. For most of the summer, natural gas production was relatively flat or declining, but more recently production has increased substantially. In September, storage injections have been relatively high, largely because of increased production, milder weather, and lower natural gas demand from the electric power sector following power outages caused by Hurricanes Harvey and Irma. 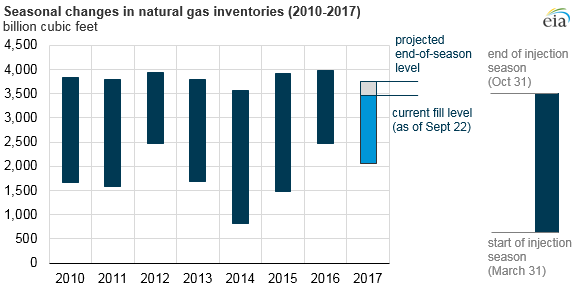 EIA’s Short-Term Energy Outlook projects natural gas inventories in the Lower 48 states to reach 3,755 Bcf by the end of October 2017, about 48 Bcf lower than the previous five-year average and 222 Bcf lower than at the end of October 2016, when inventories reached 3,977 Bcf.